Launching the Imagination treats design as both a verb and a noun―as both a process and a product. Design is deliberate―a process of exploring multiple solutions and choosing the most promising option. Through an immersion in 2-D concepts, students are encouraged to develop methods of thinking visually that will serve them throughout their studies and careers. Concise. Every sentence has been refined, so that maximum content can be communicated as clearly and concisely as possible. Colorful. In addition to full-color throughout the book, the writing is livelier than that in most textbooks. Analogies are often used to expand communication, and every visual example has been carefully selected for maximum impact. Comprehensive. 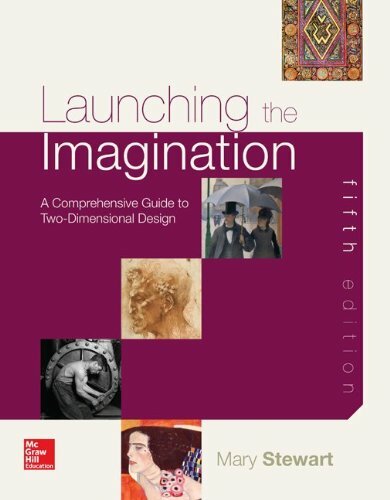 LTI is the only foundational text will full sections devoted to Critical and Creative Thinking and to Time-based Design. Photo program is global, represents a myriad of stylistic approaches, and prominently features design and media arts as well as more traditional art forms. Contemporary. Over half of the visual examples now represent artworks completed since 1970. Compelling. Four new Applied Creativity interviews have been added to this edition. With at least four visual examples per interview, this new feature follows the process by which leading artists and designers have developed their artworks. In Chapter 5 designer Steve Quinn describes the seven-step sequence he uses in developing websites, logos, and motion graphics. In Chapter 6, Jim Elniski describes Greenhouse Chicago, an adaptive re-use home that is both highly energy-efficient and beautiful. In Chapter 7, Kendall Buster describes stages in the completion of a complex sculpture, from preliminary drawing to installation. In Chapter 8, painter Carrie Ann Baade discusses the sources of her images and four major steps in their development. Five artist Profiles have also been retained from previous editions: Illustrator Bob Dacey, painter Suzanne Stryk, metalsmith Marilyn da Silva, ceramicist David MacDonald, and composer Michael Remson. Up to eight additional interviews can be added to through custom editions. Working together, the Applied Creativity interviews and the Profiles give students direct access to a wonderful range of practicing artists and designers.